CHANGES. Promoting Positive Wellbeing. Community Health Project. Stress. Worry. Panic. Feeling on Edge. Low self-esteem. Download "CHANGES. 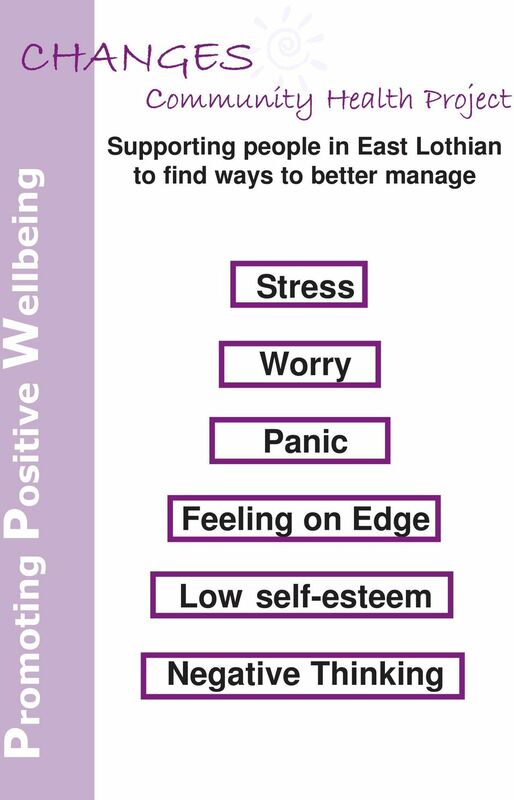 Promoting Positive Wellbeing. Community Health Project. Stress. Worry. Panic. Feeling on Edge. Low self-esteem." 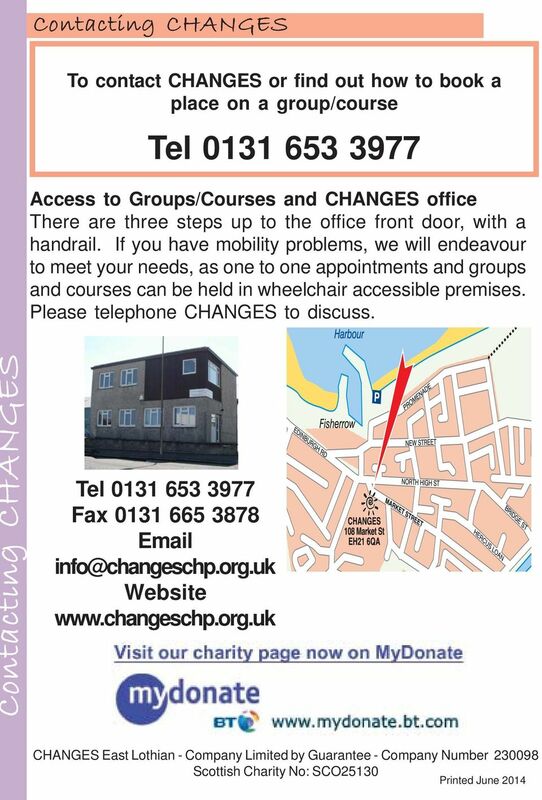 4 What you can expect from us A safe, supportive space to talk. 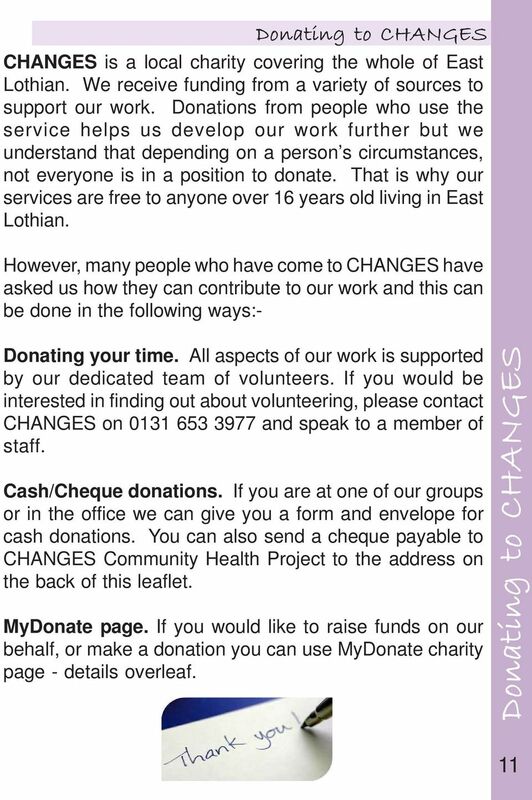 4CHANGES Community Health Project Confidentiality: We never share information about you outside of our team, except if there is risk of harm to yourself or to others. In such cases, we would try to discuss this with you first before contacting the relevant agency, for example your GP. 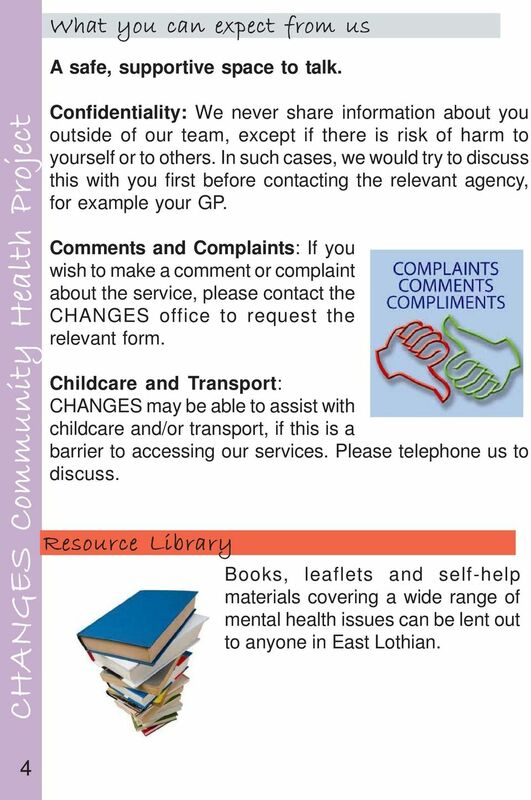 Comments and Complaints: If you wish to make a comment or complaint about the service, please contact the CHANGES office to request the relevant form. Childcare and Transport: CHANGES may be able to assist with childcare and/or transport, if this is a barrier to accessing our services. Please telephone us to discuss. 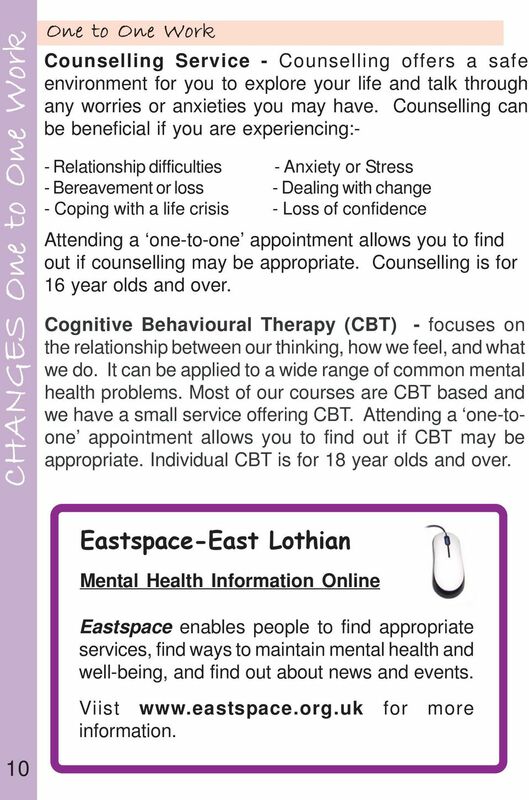 Resource Library Books, leaflets and self-help materials covering a wide range of mental health issues can be lent out to anyone in East Lothian. 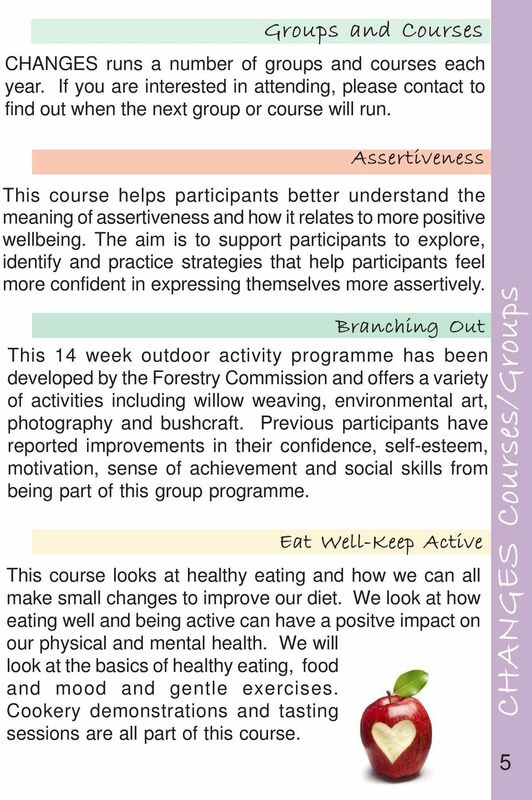 6 CHANGES Courses/Groups 6 First Steps Towards Positive Mental Health & Wellbeing This cognitive behaviour based course helps participants to increase awareness and understanding of their emotions, thinking, behaviours and physical changes in relation to how they affect our ability to cope in life. 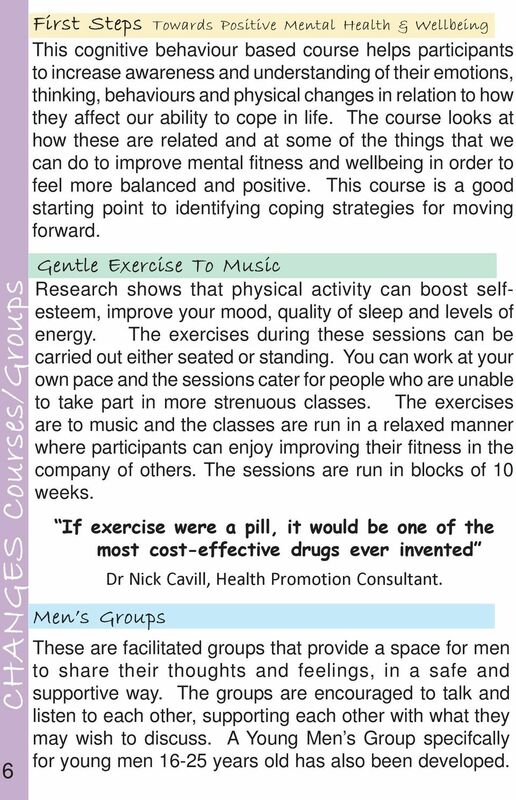 The course looks at how these are related and at some of the things that we can do to improve mental fitness and wellbeing in order to feel more balanced and positive. This course is a good starting point to identifying coping strategies for moving forward. Gentle Exercise To Music Research shows that physical activity can boost selfesteem, improve your mood, quality of sleep and levels of energy. The exercises during these sessions can be carried out either seated or standing. You can work at your own pace and the sessions cater for people who are unable to take part in more strenuous classes. The exercises are to music and the classes are run in a relaxed manner where participants can enjoy improving their fitness in the company of others. The sessions are run in blocks of 10 weeks. If exercise were a pill, it would be one of the most cost-effective drugs ever invented Dr Nick Cavill, Health Promotion Consultant. Men s Groups These are facilitated groups that provide a space for men to share their thoughts and feelings, in a safe and supportive way. The groups are encouraged to talk and listen to each other, supporting each other with what they may wish to discuss. A Young Men s Group specifcally for young men years old has also been developed. 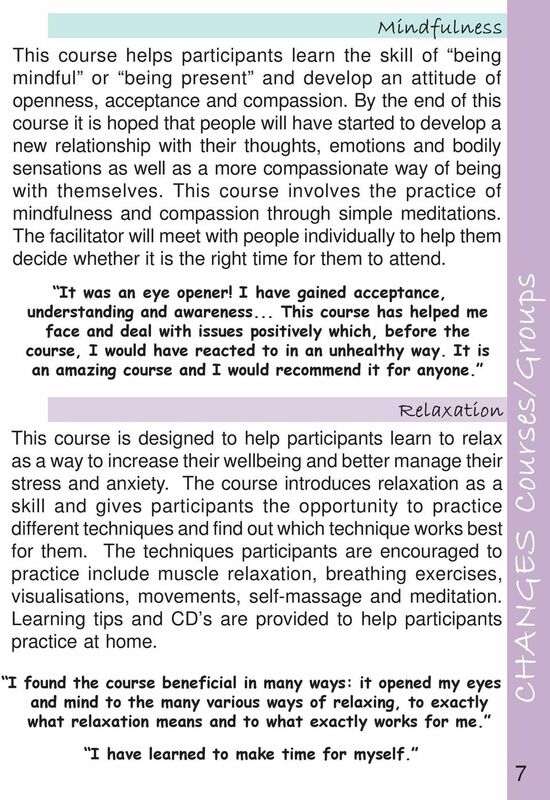 8 8CHANGES Courses/Groups Stress Control This class is open to anyone wanting to learn new ways to manage the stress in their lives. The class uses the Stress Control materials, which are proven techniques to help manage difficult feelings, thoughts, behaviours, panic attacks and sleep problems. This class is taught using lecture style presentations instead of a therapy group. People attending are never asked questions and there are no group discussions. 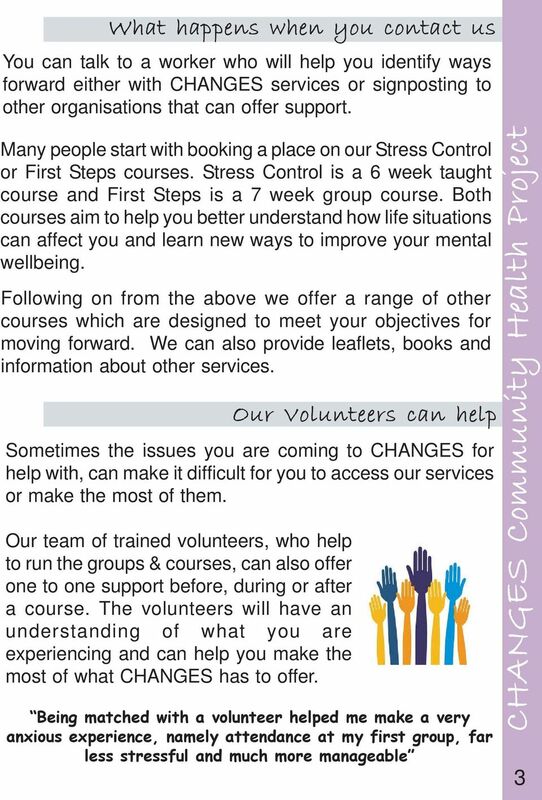 Small self help workbooks are given out each week for participants to refer to at home. People can attend with a friend, family member or work colleague. 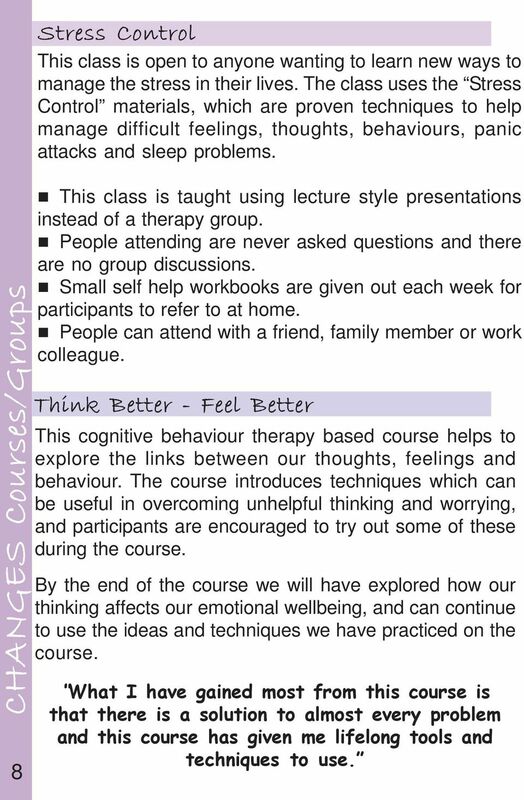 Think Better - Feel Better This cognitive behaviour therapy based course helps to explore the links between our thoughts, feelings and behaviour. The course introduces techniques which can be useful in overcoming unhelpful thinking and worrying, and participants are encouraged to try out some of these during the course. By the end of the course we will have explored how our thinking affects our emotional wellbeing, and can continue to use the ideas and techniques we have practiced on the course. What I have gained most from this course is that there is a solution to almost every problem and this course has given me lifelong tools and techniques to use. 9 Understanding Anxiety This group is an opportunity for people to discuss their personal experiences of anxiety. Participants are encouraged to reflect upon the way they relate and react to their anxiety. This group includes discussions on different ways to look at anxiety such as: why we feel anxious, what happens to our body and our mind, and the way anxiety has impacted upon our life. The general aim of this group is to support people to feel more confident, accepting and less intimidated by their anxiety. Healthy Living Project 9CHANGES Courses/Groups Through taking part in the Healthy Living Project, participants have experienced the many benefits that being active can bring. Being active can boost your self-esteem, help you concentrate, reduce tension and help you sleep. 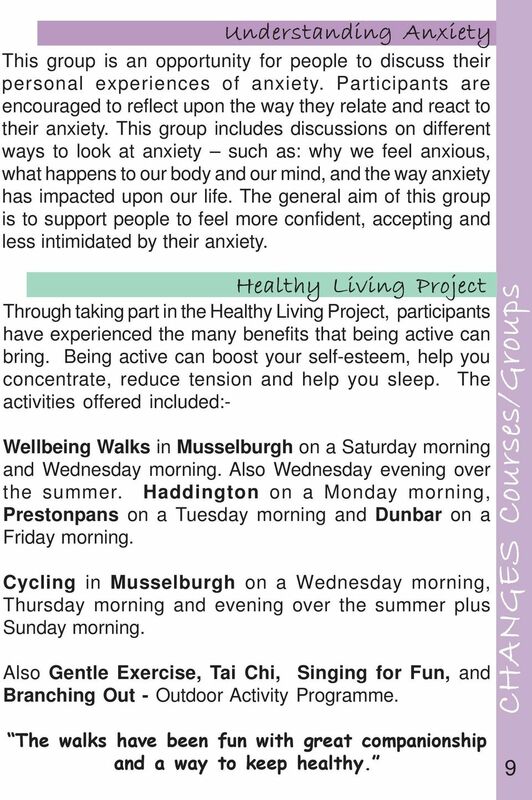 The activities offered included:- Wellbeing Walks in Musselburgh on a Saturday morning and Wednesday morning. Also Wednesday evening over the summer. Haddington on a Monday morning, Prestonpans on a Tuesday morning and Dunbar on a Friday morning. Cycling in Musselburgh on a Wednesday morning, Thursday morning and evening over the summer plus Sunday morning. Also Gentle Exercise, Tai Chi, Singing for Fun, and Branching Out - Outdoor Activity Programme. The walks have been fun with great companionship and a way to keep healthy. Family members and significant others affected by the drug or alcohol use of another person Having a member of your family, a relative or friend with problematic drug or alcohol use can be very distressing. POLICE How to manage your mental wellbeing Blue Light Programme How to manage your mental wellbeing This booklet is for anyone in the police service who wants to improve and maintain their mental wellbeing. 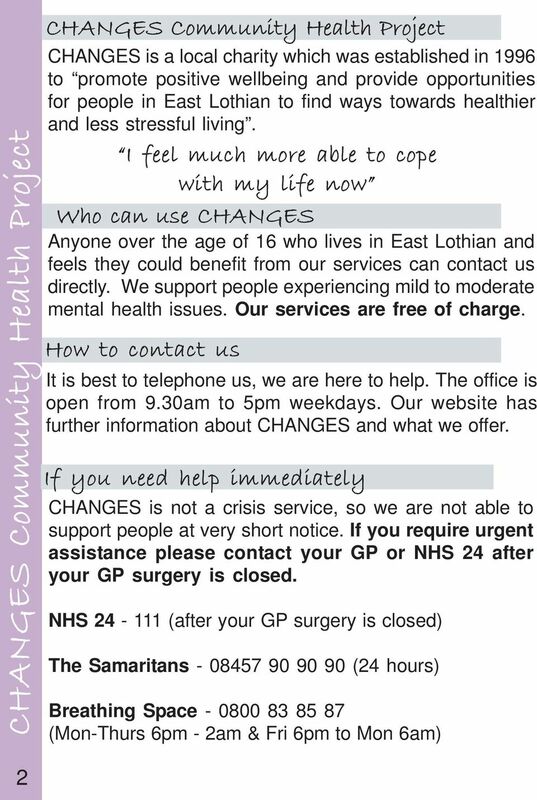 Our Vision Optimising sustainable psychological health and emotional wellbeing for young people. E-counselling ... The Counselling Service offers an e-counselling service to School of Education students. Wednesday 14 th of August, 2013. The Letter of News Wednesday 14 th of August, 2013. It has been awhile since our last letter of news, so we thought we would fill you with a few happenings and events around CaS Therapy. Exciting News! WHICH talking therapy for depression? How to... Look after your mental health 1 What is mental health? Hi, how are you doing? I m good thanks, glad it s the weekend. You? Bit fed up actually; it just feels like everything I do goes wrong.